Wow, the airplane ride and especially the skyride look awesome. “CENTURY of Progress” is the name given the 1933 Chicago World’s Fair, and the whole show is well named, for it is an exposition depicting the progress of man’s advance in civilization in the last 100 years. And this progress revolves almost entirely around the advances made in science and mechanics in that length of time. 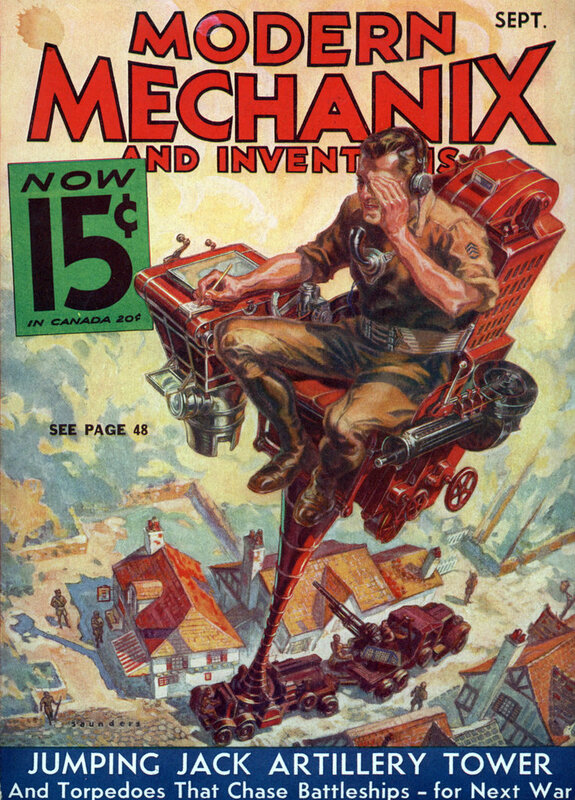 Every conceivable mechanical oddity worth displaying is on show, and each month during the course of the exposition Modern Mechanix and Inventions will display for readers who are unable to view the fair an increasingly augmented series of unusual pictures to help carry the true import of the exposition. 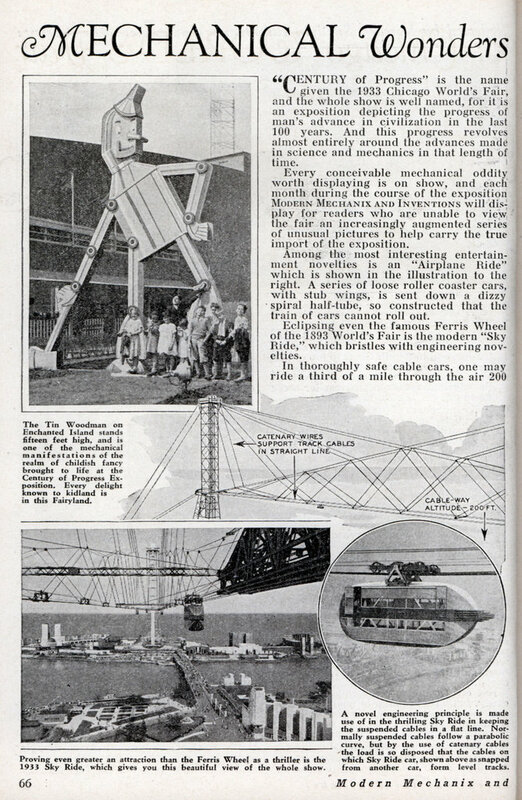 Among the most interesting entertainment novelties is an “Airplane Ride” which is shown in the illustration to the right. A series of loose roller coaster cars, with stub wings, is sent down a dizzy spiral half-tube, so constructed that the train of cars cannot roll out. Eclipsing even the famous Ferris Wheel of the 1893 World’s Fair is the modern “Sky Ride,” which bristles with engineering novelties. In thoroughly safe cable cars, one may ride a third of a mile through the air 200 feet above ground. The cables suspending the cars are kept in a straight line by a system of catenary suspension wires which take the usual parabolic curve out of the suspended cable-way. This cable-way is supported from towers which are 100 feet higher than the Washington Monument, and are nearly as tall as the Woodworth building. An observation tower atop each allows an observer to see three states at onceâ€”Indiana, Illinois and Wisconsin. Huge weights of concrete act as shock absorbers for the cables, and take up shocks that are caused by sudden gusts of wind.